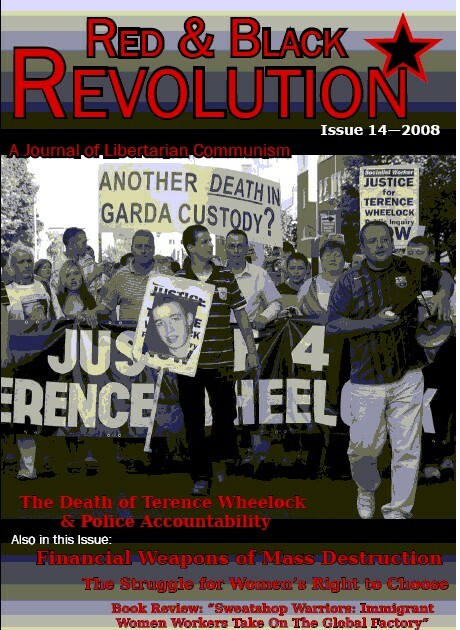 The Spring 2008 issue of Ireland's anarchist magazine Red & Black Revolution is now available. Articles include “No Justice, Just Us” Interview with Larry Wheelock, Financial Weapons of Mass Destruction, How free can you be if you can’t even control your own body?, Book Review: “Sweatshop Warriors: Immigrant . Interview with Larry Wheelock, brother of Terence, who was killed in police custody. The first part of a series of articles investigating the capitalist financial markets from a critical perspective. This article looks at the financial markets, particularly focusing on the mechanics of some of the instruments that have led to a momentous transformation of the workings of global financial markets in the most recent decades. How free can you be if you can’t even control your own body? Ireland still has one of the most regressive anti-choice regimes in Europe. Alan MacSimóin looks back at twenty five years of pro-choice struggle and anarchist involvement in it. Gregor Kerr reviews Miriam Ching Yoon Louie's Sweatshop Warriors: Immigrant Women Workers Take On The Global Factory.